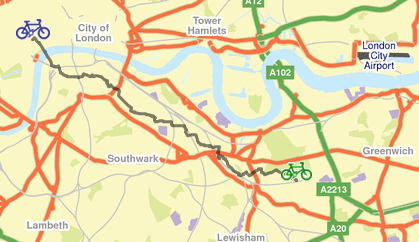 Is it realistic to think about cycling from Blackheath to Central London (near Covent Garden)? I only wondered, because I really should find a good source of exercise, and TfL’s site appears to suggest a route, but it looks like it might take ages… Also, I’m a bit rusty and slightly concerned about getting knocked off my bike! But I like the idea of going through the tunnel under the Thames to get to work. Does anyone else do this? Is there a quiet route – please send me a Google Map! 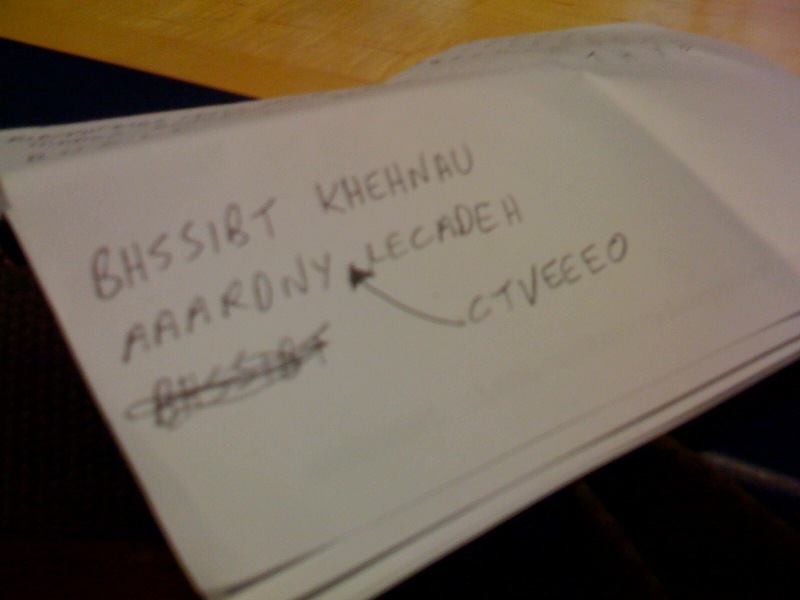 Then answer question 4, and you should have no trouble decoding The Blackheath Code. You’ll find the keyword if you stare at the headline to this post. The answer will be published in a few days. Further reading, and highly recommended (although entirely unrelated to Blackheath) “The Code Book ” by Simon Singh. I don’t know if you remember this advert, but it was filmed at Oxfam over a couple of very hot July days 2 years ago! Click the picture to go to the ad. I don’t remember the ad, but then I tend to skip most of the ads, by various means… It is a strange one – are they taking a pot-shot at the Cookery Nook? I’d quite fancy a cut price waffle iron if I could find one! There’s not a great deal of Blackheath visible, most of it is tastefully blurred out in a depth-of-field that makes the ad look like an old romantic movie. A bit of the shopping arcade next to Oxfam and the sofa shop is visible, and there’s a good shot of the Picture Gallery behind him, but that’s about it. I don’t know where the big billboard is (but then again, it could be anywhere). 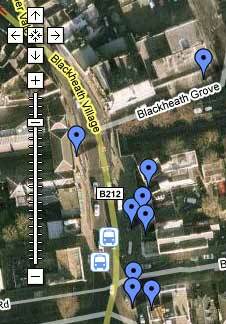 Does anyone else have any examples of Blackheath caught on film, besides this one, and the Hexagonal House? I’m still trying to get hold of a copy of “BBC – Voice of Britain“, made in the 1930s by the GPO Film Unit (now named “The Blackheath Arts Club” at the end of Bennett Park), as many of the scenes were also shot in Blackheath. Another great pic spotted on Flickr. Is it the Amazon? Or somewhere on the Norfolk Broads perhaps? Actually, it is the pond next to the Hare and Billet pub – a lovely spot for quiet contemplation, with or without a glass (plastic) from the pub next door. Thanks to Flickr user Londonjoolz for allowing me to reproduce it here. Check out the other vibrant pics of the Islamic garden in Southwark, too. Just wandering back from taking Mrs Bugle down to the station for a lovely night shift at 11.30pm, when I heard a huge smashing noise. As I walked back up the steps, it seemed that a dark car was stationary across the road, having crashed into a lamp post next to the Booze Busters newsagents. 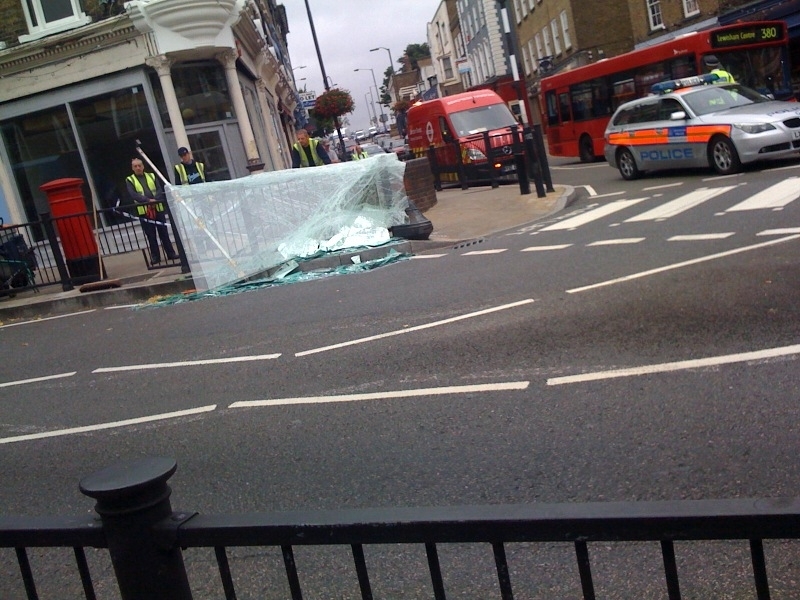 Out of nowhere a police car appeared – it must have been there within two minutes of the crash. It didn’t look particularly serious, but it was hard to tell in the dark, and the police were already there. Loads of police swarming around Blackheath village at 9am this morning. It seems as though a pane of glass was being unloaded from a truck when something went wrong, and it shattered all over the road and pavement, just next to Tuck’s corner. Just boarded my first ever Talkie Bus. 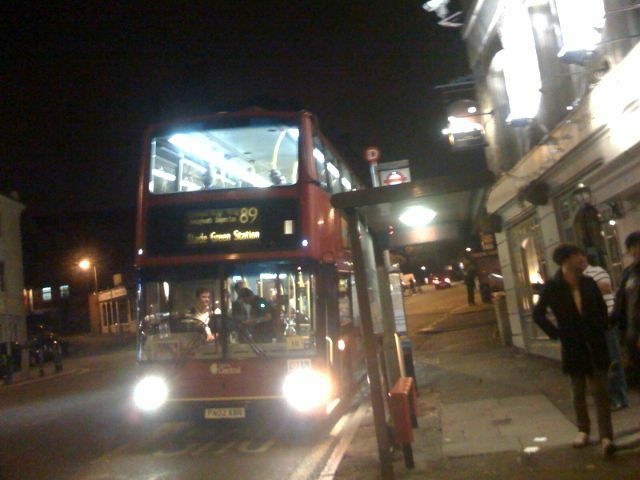 I’d read about them, but never actually experienced them… If you fancy giving one a try, just jump on a number 89 from Lewisham to Blackheath. At every stop a voice will bark “89”, followed by the (somewhat spurious) name of the stop. I think the problem is that areas in London with tube stops are known by their station-names, because of their scarcity. But when every single bus stop is blurted out at you, most of them seem so irrelevant. I read somewhere (if I remember, I’ll link to it) a blind person saying that they didn’t find the announcements helpful. I’d have thought that they would be, but they just seem so invasive. The other thing is the choice of voices – these are not the honeyed tones of Joanna Lumley silkily informing you that “you have email” (or should that be “sorry you’re with AOL”?). Maybe they should use the mellifluous tones of Neil Nunes (who doesn’t seem to exist at all on the internet in audio form). But no, they have some terrible set of announcements shouting the names at you. What’s worse is that “bus stopping at next stop, please stand well clear of doors” is still going strong. Why the truncated sentence? If you’re going to insist on a recorded voice hectoring your passengers customers, you could at least speak in full sentences! And the doors lady isn’t even the same (terrible) voice as the bus stops announcer. So there isn’t even any harmony between the two! I’m hoping they might break into an argument soon. Sometimes they talk over each other, along with the psssh psssh pink noise warning sound. Ahh, so you’re a waffle man!